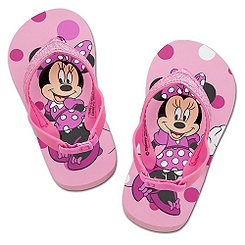 Flip Flops for Kids on Sale for $2.99 Per Pair at the Disney Store! Right now you can stock up on kids flip flops (regularly $6.50 each) for just $2.99 per pair at the Disney Store. (The sale is also valid online.) At this great price, you can even stock up on flip flops for next year. Disney flip flops are my daughter’s absolute favorite – she will not wear any other type! They are all well made AND totally cute. This weekend the Disney Store located in Springfield Mall still had a wonderful selection of characters and sizes in stock. Go get them before they are gone!